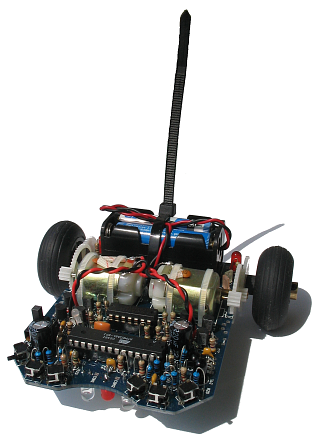 Essentially, Simsuro is a C library for ASURO, an educational robot developed by the German Aerospace Centre (DLR). Focus of this implementation was to produce efficient and well-documented code, that lacked a bit in the original library. This library has not yet reached the same functionality of the original one, but there are already a few extensions like the integrated decoding of RC5 remote control signals. This makes the use of infrared remote controls with ASURO quite easy. Generally, there are different ways to realise a simulator. One way is to simply re-implement the library functions, thus emulating the library interface. Another way is to emulate the complete op-code set of the target processor. Simsuro chose something in-between: As far as possible, the complete IO vector of the ATmega8 is emulated. The advantage of this is, that own library functions may also be tested easily within the simulator. For now, the LED control and write-access to the serial infrared interface already works, but there is still a lot of development work left.